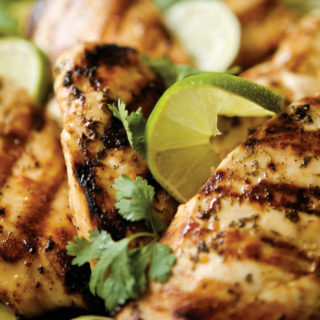 Pour 1/3 cup of Norman Bishop Mexican Lemon & Lime Marinade in skillet. Heat to medium. Add chicken breasts and continue to heat until golden brown on both sides and not pink (about 10 minutes). Transfer chicken to a 9 x 13 inch baking or casserole dish. Baste with marinade and bake at 375F for about 15 minutes occassionally basting with marinade. Add cheese prior to finish, ensure melted.